This is a recipe, along with the accompanying video, where I take a Simple Vanilla Cake and transform it into an elegant multi-layer cake. It is not a butter cake, it is a cake where the fat is in liquid form (oil). So you have a cake that is wonderfully moist and tender. Similar, I think, to the texture of a pound cake. For this cake I decided to fill and frost it with a tangy and flavorful Cream Cheese Frosting which nicely offsets the sweetness of the cake. Decorate the top of the cake with birthday candles, fresh berries, white or dark chocolate shavings, or even colorful candy sprinkles. What I like about cakes containing oil, is their moist texture and how you can store the cake in the refrigerator and it doesn't become too firm. I also like how this Simple Vanilla Cake is easy to make. For flavoring I have added some grated lemon zest, but you could use orange zest or even lime zest. Zest is the outer skin of the citrus fruit. When grating the zest be sure to first wash the fruit and only grate the yellow outer skin of the lemon, not the white pith underneath as it's quite bitter. Now, let's talk about what type of oil to use in this cake. While you can use any flavorless oil such as vegetable, canola, safflower, or corn oil, my preference is to use a light tasting extra virgin olive oil. I really like how olive oil adds a depth of flavor to the cake. You can even use a lemon or orange flavored extra virgin olive oil which I particularly like. If you decide to use the flavored oil I would leave out the lemon zest called for in the recipe. 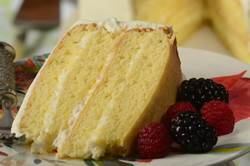 Once the cake layers have been baked and cooled, each layer is cut in half and brushed with a soaking syrup. The syrup is used to add flavor and also helps to keep the cake nice and moist. A soaking syrup is just a boiled mixture of sugar and water to which you add some flavoring. While I've added some Grand Marnier, you could use another liqueur or you can add some vanilla extract (or other extracts) or even a fruit juice. The Cream Cheese Frosting is the same frosting that I used for the Red Velvet Cake. This frosting contains both cream cheese and mascarpone cheese, which is an Italian cheese that is thick, buttery-rich, delicately sweet and velvety, ivory-colored cheese produced from cow's milk. It is normally sold in 8-ounce (225 gram) tubs and you can usually find it in specialty food stores or in the deli section of your local grocery store. Now, if you cannot find Mascarpone just substitute with another 8 ounces (225 grams) of regular cream cheese. Which means using 16 ounces (450 grams) of cream cheese altogether. Besides the cream cheese and mascarpone, this frosting also contains whipped cream which makes the frosting taste so good and gives it a silky smooth texture. Evenly divide the batter between the two prepared pans, smoothing the tops with the back of a spoon or an offset spatula. Bake about 25 to 30 minutes or until a toothpick inserted into the center of the cake comes out clean and the cake springs back when pressed lightly in the center. Assemble: Cut the two cake layers in half horizontally (so you will have four layers of cake). Place one cake layer (top of the cake facing down) on your serving plate and lightly brush with the soaking syrup. Spread with a thin layer of frosting. Next, lightly brush the cut side of the next layer with the soaking syrup. Place the cake layer (cut side facing down) on top of the frosting and spread with a thin layer of frosting. Repeat the process with the next two cake layers. Then cover the entire cake with the remaining frosting. The cake can be covered and stored in the refrigerator for 3-4 days.